I need a 2 week tune-up so I can get in shape for my bathing suit.. vacation in Jamaica is coming in 3 weeks! The last few days have been an amazing respite from the harsh winter. It's been fabulous to be able to go outside without a heavy coat or big, furry boots. On bright, sunny days it's not hard to get motivated to exercise and eat right, but I'm afraid we've got another round of arctic chill to get through before we can truly spring forward. I refuse to let slushy weather let me fall prey to comfort food and couch potato-dom! There's still plenty of time to lose weight and get back into the fitness groove before bathing suit season; I just need a plan. Here's an easy one to try: Yoplait Light´s Two Week Tune Up Plan. By making a few lifestyle changes (like simply substituting your regular breakfast and lunch for a Yoplait Light yogurt, a whole grain, and a fruit and walking daily), you can lose five pounds in two weeks. The Yoplait website features useful weight loss tools such as a meal planner, healthy recipes and a daily food and exercise tracker to help you reach your goals. I received a motivational kit from Yoplait and MyBlogSpark including a gym bag, wrist wallet and pedometer as well as coupons to try the Two Week Tune Up. I've been trying it out and although I can't say I've lost much yet, I haven't gained anything, which is just as important to me in this winter hibernation season. There are 33 flavors of Yoplait Light to choose from, so my tastebuds never get bored. Click here to download a printable coupon for $0.75 off the purchase of four (4) Yoplait Light yogurts. 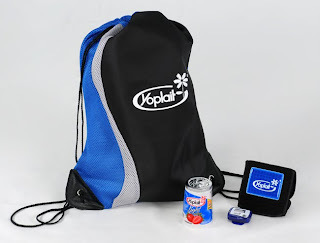 To enter and win a Yoplait Light Two Week Tune Up kit similar to the one shown above (including a gym bag, wrist wallet, pedometer and coupon for one cup of yogurt), please comment on this post with your reason for needing a Two Week Tune Up or your favorite Yoplait Light flavor. Entries will be accepted through March 17th and I'll pick the winner using Random.org. US readers are eligible. I have gained more weight and have swollen ankles and legs... I definitely want to lose more and with a two week tune up it will give me some motivation to get out and get some exercise. with the cold weather and all the Northeast snow, it hasn't been a great winter for exercise. I need it to keep up my committment to lost 50 pounds before Thanksgiving. My favorite flavor is raspberry! Yum yum! Thanks for the review. I've lost a ton of my motivation ever since graduating school and would love to have the pedometer to really remind myself to get active again. also love the triple berry flavor!